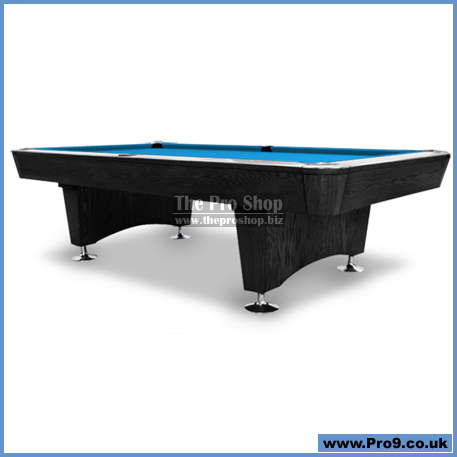 DIAMOND BILLIARD PRODUCTS INC. most popular table is the 9ft PROFESSIONAL. Precision fitting frame. Developed by professional players with skilled engineers and designers. 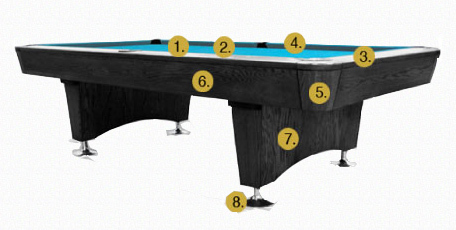 Meets or exceeds all specifications from the Billiard Congress of America. Used at major sanctioned tournaments across the United States. Performance engineered to provide exceptional play capability in both commercial or private usage. Matching ball return system and table light fixture available. Proudly made in the United States. 7ft, 8ft and 9ft uses 30mm Brazilian slate precision machined top and bottom. Slate supported by massive 5" beams of Timber Stand LSL (laminated strand lumber). *Note: Two tables are available right now. These tables are nearly new. One is black and the other one is charcoal. These have been used only in two tournaments including the recent World Pool Masters. Price for this table with 3-piece slate including the tour used Simonis 860 cloth is £5160 including VAT. Delivery and set-up would cost extra £543 and this would need to happen on 29th September 2015.